He’s lived outside for seven years. He’s not homeless. The truth is, he has a home. And while it may not be inside four walls, he’s living a valued life. Like squirrels and birds, feral cats are unsocialized and are content living outside. But where do cats like these come from? Born outside, these unsterilized cats eventually form colonies, making their home wherever they can find food. Tomcats prowl for mates, females become pregnant, and the cycle of reproduction continues. Why Do These Cats Need Our Help? Left unaltered, free-roaming feral cats continue to reproduce creating more homeless kittens. Through TNR, these cats live out their lives without adding to the homeless cat population. According to scientific studies, feral cats gain weight and live healthier lives after being altered. 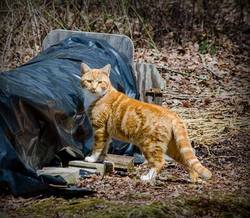 TNR programs are proven to stabilize and significantly reduce the size of feral cat colonies. By limiting feral cat populations, fewer unwanted and homeless cats are taken to shelters and euthanized. To help them, Community Cats Coalition has a cost effective plan that not only reduces feral cat populations, but also improves and extends the lives of colony members. It’s called Trap/Neuter/Return or TNR.